The Morgan fireplace wood-fired insert produces a combination of both power and beauty. 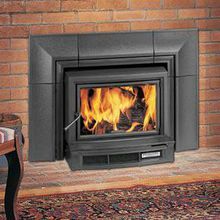 The 1.7 cubic foot firebox produces 40,000 BTUs of heat and can heat up to 1,200 square feet. The thick soapstone panels that line the inside of the firebox gives the Morgan the thermal mass that separate HearthStone stoves from other products. The combination of cast iron and soapstone will add several hours of heat life to the already strong burn time of up to 8 hours. Heats up to: 1,200 sq. ft.
Firebox Capacity: 1.7 cu. ft.